Rex Hotel, Whitley Bay - Ready Steady Gone! The Rex Hotel, an impressive looking Victorian building on the sea front at Whitley Bay, was a popular venue for both local and national bands from the mid sixties through to the late seventies. I first played there in 1968 with a band called the Village and for the next three years or so it became one of my favourite venues, both as a performer and a punter. I remember seeing the late great Robert Palmer singing at the Rex sometime in 1969 with the Alan Bown Set just after he had replaced Jess Roden. Local bands were booked at the Rex for a weekend or for one night only. Sometimes you got to support a named band. I recall supporting a couple of chart bands there in 1969 – Love Affair and Simon Dupree and the Big Sound who had charted a couple of years earlier with ‘Kites’. In 1969 a lot of top named acts were booked at the Rex, usually supported by a local north east band. Some of the bands that appeared at the venue in 1969 were: Status Quo, the Troggs, the Foundations, Vanity Fair, Chicken Shack and Family. North east promoter, Ray Grehan began putting on gigs at the Rex Hotel in 1970. Ray was the owner of the nearby Crescendo Club. Although the Rex was a licensed venue it drew in a much younger age group than the Crescendo. Perhaps hoping to draw teenagers into the Rex and an older crowd into the Crescendo on the same night, he booked some top named bands to appear at The Rex and later the same evening at the Crescendo. Some of the bands that appeared at Ray Grehan’s “dual” venue were: the Coasters (from the USA), Gebo Washington and the Ram Jam Band, Zoot Money & Dantallion’s Chariot, the Herd and Edison Lighthouse. “……it was an unusual and attractive booking for bands in more ways than one: the principal oddity being that you could be booked to play the weekend as residents, or purely on the Monday night, as the guests. This is how it worked. . . If you were booked to play the weekend you started on the Saturday night. The dance floor, which was huge (a proper ballroom), was cleared of tables and chairs which were set up around the perimeter. The stage was overhung by a balcony above, right in the middle at the back, just where the drummer set up; a nightmare for me, sat up high behind my over-indulgent kit and grossly elevated cymbals. The bar was immediately ‘stage-left’ and amounted to little more than a walk-through closet which you entered by the stage and bought your Dog (Newcastle Brown Ale) from the bottle-juggling-barman: Don. Forget ‘Cocktail’, Tom Cruise wouldn’t have lasted five minutes keeping up with the pace that Don achieved. Then you exited through the other door out into the ballroom. If you were a musician, you stood in a line by the side of the stage to better scrutinise the competition; your bottle tucked under your arm, ready to top-up your half pint glass. 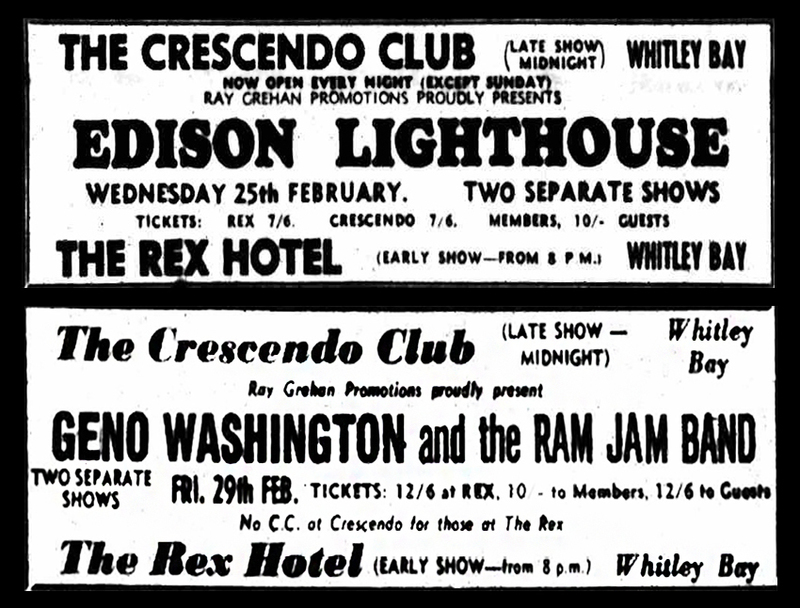 “A regular gig was the Rex Hotel in Whitley Bay. This was in a large ballroom and quite a big gig, always with TWO local bands. The first band to arrive was told to set up on one stage and that they would be performing first. The next to arrive was told to set up on the other stage at the opposite end of the ballroom. They would perform last. This meant that if you arrived last you had the appearance of being top of the bill. You can be sure that we always tried to arrive last and if we got to the venue and did not see another van unloading, we drove round a bit to delay even more. (More about Bullfrog on this link). Brethren, an early incarnation of Lindisfarne (before Alan Hull) were regular performers at the Rex in 1969. Around this time Alan Hull had left his full-time job in nursing to concentrate on performing at a folk club which he organised at the Rex. Artists that are said to have performed at the folk club early in their careers are – Al Stewart, Gerry Rafferty, Billy Connolly and Ralph McTell. In 1970 Alan Hull and Brethren appeared regularly at the Rex Folk & Arts Club as separate acts before getting together as Lindisfarne later that year. My dad was Syd Warren and played at the Rex Jazz Club on a Sunday night. He played the saxophone. His group of merry men were called Syd Warren Six I think. Just wondered if you had a photos please. Do you have any information about those two old dears - Mitzi and Minnie I think they were - a pianist and violinist who played blues locally frequently appearing at the Rex, the Station Hotel and the Glen Ogle guest ? Are there any members of Mr Poobah's Chicago Line still in the area and on facebook. Hi,Sometime around 1970 to 1971 I went to the Rex Hotel to a mid week band night . The Band advertised to be on were called Paladin but for some reason a replacement band turned up instead and performed their Second album Trespass. It was Genesis and I was blown away by the sound and was a big fan of theirs until Peter Gabriel left in 1975. I cannot find any mention of Genesis playing there but I can assure you They did. Not a very big crowd in the ballroom so Peter Gabriel asked us all to move forward to create a better atmosphere. I will never forget that night. Does anyone have any photos of ballroom dancing competitions that were held here in 1974/75? I also saw Genesis at the Rex, probably around 1970/71 and the audience consisted of about 10 people. I saw it advertised in advance as Genesis and think this must be a different night to the one Mike Peacock refers to. My name is Mick White and I'm writing the official biography of Leicester rock band FAMILY (1966-73), who I believe played at the Rex Hotel on 30 October 1969. I would be most grateful if you could let me know whether you have any records on file regarding this concert, or could point me in the right direction.